Moolmanshoek provides an unique South African environment. This is a special place for that fairytale wedding or break-away you have been promising the family. A private nature reserve of over 3 500 hectares, Moolmanshoek was developed from a conservation area into a natural heritage site. It is situated in the district of Ficksburg in the Eastern Free State at the foot of the Witteberge Mountains. Enjoy the rich wild and birdlife or experience the hiking trails on and around the farm. Fishing in the clear spring water or experiencing breathtaking views from horseback are but few of the activities available on the farm. For the adventure-lovers there is the Visierskerf 4x4 Eco-route and a variety of hiking trails. Steeped in rich history dating from before the Great Trek, the farm is skillfully managed by its friendly staff. Whether it is a conference, meeting, team building, wedding or any other function, Moolmanshoek provides a high standard with facilities and catering to suit your requirements. A large conference hall seating up to 30 persons is available as well as a "break-away" room, library and sun deck room, each seating 10 persons. Overhead projectors, flipcharts, TV/video and a large screen are at your disposal. Catering from tea and coffee breaks to full lunches and dinners are available as well as a bar. For functions there is a large reception hall seating 150 to 180 persons with an exclusive bar and braai area. A local professional photographer is available and music can be arranged. A custom-built chapel seating 65 inside and 140 outside is available. Relax in the thatched-roofed restaurant, with its excellent cuisine and bar facilities and end off your day in one of the luxury modern sandstone suites for a peaceful night's sleep. Moolmanshoek Private Game Reserve charges a Resort entry fee of R75 per person. Standard Twin Sleeps 2 Includes: D B & B Rooms / Units: 4 En-suite bedrooms. Most suites have fireplaces or Queen Ann stoves. Twin beds. 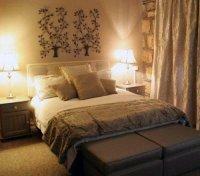 Cosy Sleeps 2 Includes: D B & B Rooms / Units: 3 En-suite bedrooms with panel heaters. Family Suite Sleeps 2 Includes: D B & B The Family Suite has 1 Queen Bed and 2 Twin Beds for children under 16. Moolmanshoek is owned and managed by a wonderful family. Dedicated to making your stay with them something one would remember for ever. 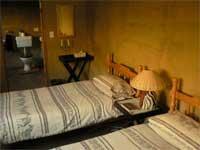 The rooms are well equipped with all that is required and fantastic beds. It is situated on a plain surrounded by amazing sandstone mountains and the view from the mountains reminds me of the Serengeti where animals roam free. We had a wonderful three days in the most beautiful surroundings. We just loved the trip out to the meerkats in the early morning with Sheldon and the walks through the reserve. The food was delicious and we received wonderful, friendly service. This is a truly peaceful, blessed place to stay. Thank you. We were very impressed with the hospitality and friendliness of the Nel family. Isabel made a plan to accommodate us (8 people) at the last minute when everything else around Ficksburg was fully booked. We stayed in the Hikers House which was very tidy, clean and super cost effective. We've booked the same place for next year. If the service at the Hikers House is this great we can only imagine how fantastic the rest of the place must be. Beautiful nature and very Friendly hosts, we enjoyed every minute of our stay and hope to visit the Reserve again. We will recommend it to our friends and family. Moolmanshoek Private Game Reserve is 29.2km from the centre of Ficksburg , the nearest airport 103.7km (Moshoeshoe I International Airport).